William Henry Jackson is known as America’s pioneer photographer. He published tens of thousands of prints of his work and that of other photographers, wrote extensively, painted and sketched, and built two of the most successful photographic view companies in the history of photography, his studio in Denver and later the Detroit Photographic Publishing Company. Best known for his dramatic and descriptive nineteenth-century Western-landscape photographs he worked in formats ranging from cdvs to gigantic single print multi-mammoth plate panoramics up to 92 inches wide. He began working as a photographic retoucher in 1858, studied painting and drawing, made sketches during the Civil War and turned to photography as a career in 1867, when he moved to Omaha and found employment with a leading local photographer Edric Eaton Hamilton. In 1868 he purchased the Hamilton Studio with his brother, renaming it Jackson Brothers Studio, and a year later purchased his former employer Eaton’s studio. Throughout his life Jackson found he preferred outdoor work. In Omaha he continued photographing the Pawnee and Omaha Indians in the vicinity. By 1869 he was traveling with A.C. Hull westward along the Union Pacific Railroad from Omaha, photographing towns, settlers, railroad workers, and some landscapes and received an order for 10,000 views from Edward Anthony of New York. This gave him national recognition as an important Western photographer and laid the groundwork for the marketing of albums and prints with the Hayden Survey from 1870 to 1879, as well as to his successful enterprises in Denver from 1879 to 1898 and Detroit from 1898 to 1924..
Jackson's artistic growth as a landscape photographer germinated with the 1869 work and quickly matured when he was hired by Ferdinand V. Hayden as the official photographer for the U.S. Geological and Geographical Survey of the Territories. Influenced by Thomas Moran, a painter on the survey, and photographers C. R. Savage and A. J. Russell, Jackson absorbed the aesthetic of romantic engagement of the western landscape and development and colonization of the Territories. However this was countered by the inherent drama of being the first to photograph many high mountain peaks, valleys and western scenes in a more descriptive and topographic style. He and Hayden published portfolios to be sold and given away during this time, including albums on Yellowstone, the four corners area of the American Southwest and of American Indians. In 1879 he established a studio in Denver, which specialized in landscape and scenic views competing with other large commercial studios in San Francisco, Chicago and New York. After spending the winter of 1895-1896 traveling on the Trans-Siberian Railroad, he returned and joined the Detroit [Photographic] Publishing Company. This project grew out of Jackson’s love of color and desire to make color photographs. Producing photographically generated color lithographs with the Swiss patented “photocrom’ process, the company produced tens of thousands of color scenic views as post cards, illustration pages for books and simply as scenic prints for sale. His early work includes views of Omaha, from his studio and that of studio predecessor Hamilton, scenes along the Union Pacific Railroad route (1867-1869); Hayden Survey scenes (1870-1879; e.g., Grand Tetons -Yellowstone region, Colorado Rockies, portrait and field studies of Indians, archeological sites in the Southwest and Rocky Mountains). He began publishing other photographers’ negatives under his name both with the Jackson Brothers and with the Hayden Survey. During the Denver years (1879-1898) he made scenic views of the growth of the mining industry, the railroads, settlements, cities and natural wonders in Colorado and the Rocky Mountain West. He also began aggressively publishing works he purchased from other photographers, including works he made or copied while working for Hayden. He employed and commissioned photographers and built the most successful photographic view company in America. He also made foreign scenes primarily of India, the Far East, Siberia (1894), made views and lithographic and photographic albums of the Chicago World Exposition of 1892 as well as work for the "World's Transportation Commission"; scenes of eastern United States, along the railroad routes and cities of Mexico, Central America, and the Caribbean (1883-1884, 1900-1905). With Detroit Photographic Company (1898 – 1924) Jackson created a company specializing in the printing and sale of color scenic photographic views using the photocrom process, views were from the United States, Canada, Cuba and Mexico, and the subject was generally of mountains, lakes, scenic views, views of towns and cities and historic buildings. There were over 1000 views larger than postcard size available and more popular views were printed in editions of hundreds and often in the thousands. He continued acquiring work by other photographers from around the country and made a new series of views himself throughout the eastern United States. In about 1924 the Detroit Company declared bankruptcy. Negatives and prints: Early work (1868 – 1879): With Jackson Brothers, Omaha (successors to Hamilton) and while working with Hayden Survey collodion wet-plate negatives, albumen prints (ranging from cdvs to 20 x 24” mammoth plate prints; almost always mounted on board of the period). Denver period (1880 – 1898) gelatin dry-plate negatives, albumen prints, hand colored albumen prints, ranging from stereographs to multi-mammoth plate albumen print panoramics (up to 20” high and 92” wide) and film negatives. Often identifiable by number and title in plate, plus (after 1880) "W. H. Jackson & Co., Denver, Col." in plate. May also be identified on mount (e.g., government-issued Hayden Survey prints, which are 11 x 14 on 16 x 20 white mounts with decorative borders). With Detroit Photographic Company (1898 – 1924) Jackson created a company specializing in the printing and sale of photocroms, a stone-lighography process of printing photographic images first patented in by the P.Z. company of Zurich, Switzerland, generally using between 5 and nine stones per print. Photocroms ranged from postcard size prints, to larger views, generally 3.5 x 7”, 4.5 x 6”, and 7 x 9” (or reverse). They made fewer panoramic (Up to 8 x 20”), mammoth and mammoth panoramic photocroms. They also stocked and sold albumen and silver prints previously printed at his Denver company, as well as original photographic prints in various silver print processes and finishes (collodion, gelatin, toned, matte and glossy), platinum prints, hand colored prints, as well as in a variety of sizes including multi-plate panoramic silver prints and enlargements up to 24 x 30”. PORTFOLIOS: Photographs of the Yellowstone National Park and Views in Montana and Wyoming Territories, a bound album of 37 imperial size (app. 10 x 13”) albumen prints mounted on decorative survey mounts with text printed on interleaving between each print. 1872. National Park and Views in Montana and, Wyoming Territories. Washington, D.C., 1873. 37 prints, ca.11 x 14", on 16 x 20" mounts, each with descriptive letterpress guardsheet. Department of the Interior / United States / Geological Survey / of the / Territories / F. V. Hayden in Charge / Photographs [Descriptive Catalogue of The Photographs of the North American Indians], various sizes and numbers of prints in each set or album ranging from a few dozen to 1000 prints in a large set. COLLECTIONS: The National Archives preserves Hayden Survey albumen prints. The Library of Congress holds: a portion of the working files of the Detroit Publishing Company (including 20,000 prints and 30,000 glass-plate negatives, many by Jackson); 800 prints plus many glass plates from Central America and the Caribbean; 350 film negatives of India, Far East, Siberia. The State Historical Society of Colorado (Denver) holds 7,000 nega­tives (civilian work west of the Mississippi, 1880-1902) plus other material. The Bureau of Ethnology (Washington, D.C.) holds 2,000 negatives of Pawnee and Omaha Indians. Also Acad­emy of Natural Sciences, Antiquarian Society, Amon Carter, BPL, California (Bancroft), Denver, Harvard, IMP/GEH, Museum of New Mexico, New Mexico, Princeton (Library), Smithsonian, UCLA, Yale (Beinecke). Department of the Interior. United States Geological Survey of the Territories. F. V. Hayden, U.S. Geologist-in-Charge. Miscellaneous Publications-No. 5. Descriptive Catalogue of The Photographs of the United States Geological Survey of The Territories for the Years 1869 to 1875, Inclusive. Second Edition. W.H. Jackson, Photographer. Washington: Government Print Office 1875. Denver & Rio Grande Railroad Co. Rocky Mountain Scenery. New York: American Bank Note Co. [ca. 1885]. 12 albertype prints, 9 with Jackson name in plate. Grand Canon of the Arkansas. Denver: Jackson [1880s]. 12 ills. The White City (as it was …). Chicago: White City Art Co., 1894. 80 photoetchings of the World Centennial Exposition. Mountains. Denver: Great Divide, 1894.21 ills. Jackson's Famous Pictures of the World's Fair, 1893. Chicago: White City Art Co., 1895. 80 ills. Among the Rockies: Pictures of Magnificent Scenes in the Rocky Mountains. Denver: Great Divide, 1900. The Canons of Colorado. Denver: Thayer, 1900. The Pioneer Photographer: Rocky Mountain Adventures with a Camera. With Howard R. Driggs. Yonkers-on-Hudson, N.Y.: World Book, 1929. Drawings of the Oregon Trail. New York [? ], 1929-30. 6 ills. Time Exposure. New York: Putnam, 1940. Reprint, New York: Cooper Square, 1970. Reprint, Patrice Press, Tucson, 1984. Autobiography. Picture Maker of the Old West: William Henry Jackson. Clarence S. Jackson. New York: Scribner, 1947. Pageant of the Pioneers: The Veritable Art of William H. Jackson, "Picture Maker of the Old West." Minden, Nebr. : Harold Warp Pioneer Village, 1958. The Diaries of William Henry Jackson, Frontier Photographer. Ed., intro., and notes by LeRoy R. Hafen and Ann W. Hafen. Glendale, Calif.: Clarke, 1959. 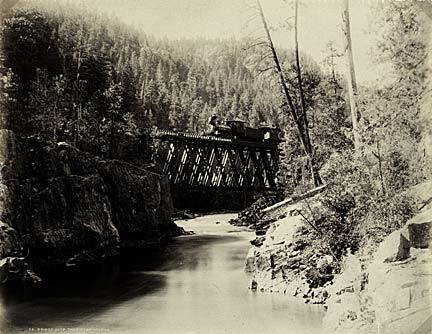 William Henry Jackson: Pioneer Photographer of the West. Aylsea Forsee. New York: Viking, 1964. Lens on the West: The Story of William Henry Jackson. Helen Markley Miller New York: Doubleday, 1966. William Henry Jackson. Dobbs Ferry, N.Y.: Beaumont Newhall and Diana E. Edkins, Morgan & Morgan, 1974. Bibliography. (Contains many images from other photographer’s negatives including the covers by A.J. Russell). William Henry Jackson's Colorado. William C. Jones and Elizabeth Jones. Boulder, Colo.: Pruett, 1975. Also limited ed. William Henry Jackson and the Transoromation of the American Landscape, Peter B. Hales, Temple University Press, Philadelphia, 1988. The Birth of a Century: Early Color Photographs of America, (William Henry Jackson), Hughes, James, Tauras Parke Press, London and New York, 1994. William Henry Jackson, An Annotated Bibliography, 1862-1995, Thomas H. Harrell, Carl Mautz Publishing, Nevada City, Ca., 1995.